To counter yesterday's red-hot demoness costume, today I'm opting for a slightly more divine style. This absolutely angelic outfit is actually inspired by one I saw on AR employee Jasmine Spearing in Blue Mars, but I've made a couple little tweaks to it to suit my personal style. The most obvious choices for an angel costume are the luminous halo and lovely wide wings from Cloud10 in Cloud City. 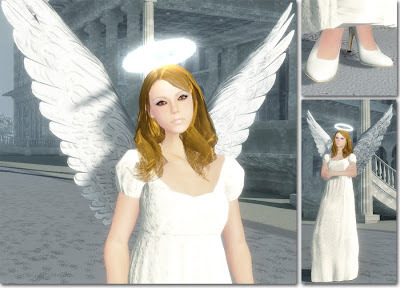 Cloud City has two separate pairs of angel wings depending on your style, and both are available for the guys as well, so you can choose the set that you find the most appealing. The lovely pure white regency-style gown from Estelle Parnall of Fashion Esplanade is a natural fit for an angelic ensemble. If you want to make it a little more formal, you can also wear the matching gloves also available in Fashion Esplanade. A pair of snow white Mako Magellan pumps from Caledonia add an extra feminine touch to the ensemble, but the length of the gown means you can easily go barefoot as well. Wavy flaxen hair from Shade City and a fair blond skin from Moxxi in Port Town are the last elements needed for this ensemble. I've layered a very pale lipstick with gloss over the skin, as well as eyeliner and a swoop of with eyeshadow. For an air of innocence, I've also added a layer of rosy blush to the cheeks, and some light freckles! Whatever your Halloween look of choice in Blue Mars is, don't forget to show it off! Check out this weeks spooky events, and details about Blue Mars' costume contests here!